The preseason is over and teams have until Saturday at 6 PM to release their 53 man roster. Just another indication of how close we are to the start of the season. Unfortunately, that means the Jets will be playing (and losing) meaningful games soon. Ugh. Anyway, here's a lot at who I think will make it to the Opening Day roster, with some extra thoughts. Ideally, Mark Sanchez would be the one cut here, but they have guaranteed him a rather large amount of money, so that can't happen. Obviously Smith is the guy the Jets are grooming to be the guy eventually, but it looks like he'll have the be the guy from Day 1 with Sanchez hurting. Simms should have gotten a chance to work with the first team because he looks like a nice talent. Only the Jets would keep four QBs, which I believe they will do. They like McElroy as a young, possible replacement in case Smith is bad early and Sanchez is Sanchez. The team doesn't trust Simms enough yet. I have no idea why they even bothered to sign Harrell. I like Kahlil Bell the best out of the three halfbacks listed here, but that's not really saying much. I don't think Ivory can stay healthy, and I don't even know what to make of him when he is healthy. Bilal Powell does nothing for me, but he may surprise me. With Lex Hilliard out for the year, Bohanon is the only fullback on the roster. Clyde Gates has looked better this year after angering me throughout last year. He's incredibly fast and if he improves his route running, could certainly be a contributor. Spadola looks like he could be a pretty nice addition to this ragtag bunch. I think Winslow is fine, but nothing special because obviously injuries have ravaged him throughout his career. He'll be essential in being a check down option for Geno Smith. Cumberland is a good blocker, so he'll have to stay. Watch Reuland, he's looking like he may be at least a decent possession receiver and he's improving all around. The five starters are going to be Mangold, Ferguson, Colon, Winters, and Howard. They just drafted Aboushi and he can be very valuable because he can play got guard and tackle. The interesting guy to watch is Vlad Ducasse. It's not out of the realm of possibility that this bust will be mercilessly cut. I just can't really make that call just yet. I know you read that last name as "Scott Wedgie." Don't lie to me. Ellis might lose a lot of his playing time to Sheldon Richardson when Coples returns from injury early in the year. But that's only if the Jets use a 3-4 base again, which might not be the case. Also, Coples may move to linebacker. We'll have to wait and see. But for now, Ellis's size, strength, and quickness make him a key player here. Harrison looks to be a pretty good backup and will be a nice contributor in the middle and at the end. Each of the last three years, the Jets have spent a first round pick on this line. The first of the three, Wilkerson had a great season last year, and I think he'll be even better this year, becoming more of a force in the pass rush. Speaking of pass rush, Quinton Coples was selected in the first round of the 2012 draft, and while he's starting the year injured, he looks to be a major factor in the pass rush when he returns, which looks like it's going to be around Week 2. His absence is why I'm listing Sheldon Richardson at defensive end, which is where he will play at the beginning of the year. As I just mentioned, the defensive scheme has been questioned recently, and we will never really know. Rex Ryan is notorious for having many versatile looks, so Wilkerson, Richardson, Coples and Ellis will find their way into the lineup somehow. Richardson's incredible athleticism makes him fun to watch, and he may just develop into an elite player. I must say that I thoroughly enjoyed Leger Douzable in the two preseason games that I watched. I was sort of surprised that Garay was cut today. Harris is obviously the star of this group. Demario Davis is at least decent in both the pass rush and run defense. He may continue to develop. Troy Davis and Lansanah have looked pretty good this preseason. Rex Ryan has been on record recently with his praise for Ricky Sapp. The one that's going to raise some eyebrows here if the fact that I have Ellis Lankster being cut. He wasn't particularly good in the slot last year, which would have been his role this season. Darrin Walls will probably be as good or better than Lankster, but he actually has some upside. Wilson needs to improve in the slot, but Isaiah Trufant has impressed me in limited time over the past few years. If they don't keep four quarterbacks, expect Allen to take that spot. Jarrett will be starting opposite Landry because well, Allen is quite bad. I have no idea why the Jets love Nick Folk so much. I think that Dan Carpenter would have been the better option because Folk has been quite inconsistent. Malone has no competition. Purdum is Purdum. Today the Mets traded Marlon Byrd and John Buck to the Pittsburgh Pirates for minor league infielder Dilson Herrera and a player to be named later. This has been quite the polarizing move in the circles of Mets fans that I've noticed throughout the day. Judging by the title of this post, and my overall philosophy when it comes to roster construction, it will be pretty easy to figure out what camp I'm in. Good riddance, don't let the door hit you on the way out, or let it, I really don't care. Both Byrd and Buck would have been out the door as soon as the season was over, faster than you could say Saltalamacchia. Neither of them would have helped the Mets get anywhere next year and certainly not by the time the team will finally be in position to make a playoff run, in 2015. Marlon Byrd's 36th birthday is on Friday, and while he's been decent this year, this success will not last for very long. In the case of 33 year old John Buck, he just has not been good this year. At all. His already paltry .652 OPS decreases to an abysmal .591 when you take away his great first 12 games of the season, when he got off to a blazing start. So yes, since the second half of the Colorado doubleheader on April 16th, the Mets have 85 times started a player who produced a .591 OPS in that time period. The only thing he's done of worth since then is become a father, and console Matt Harvey last night. That was an absolutely great moment, but it doesn't change the fact that Buck has produced nothing since mid-April. Herrera is only 19 years old and he received an invite to the Futures Game during All Star Weekend. So he can't be completely worthless. Even if he never makes it out of A ball, the idea behind this move is the important thing. It's much better to get something out of these two not very valuable assets before they leave for good. I won't even delve into the insulting idea that the Mets could have turned this deal into a blockbuster involving CarGo, Stanton, Profar, Starlin Castro or any other major league player. Please stop, and fall down a flight of stairs if you seriously believe that. Or at least never attempt to talk about sports again. For the sake of the world. Let me narrate this story of Matt Harvey to you using my ESPN Text Alerts and my reactions to it. 3:19 PM- ESPN MLB NYM - Matt Harvey underwent MRI on Monday morning for undisclosed reason, Newsday reports. Now things got interesting with the next four texts which I read all at the same time. 4:00 PM - ESPN MLB - Mets P Matt Harvey (partial UCL tear) headed to DL, may need Tommy John surgery, source tells ESPN. Ah, this is tough. This is tough for the Mets, more importantly, this is tough for Matt Harvey, and most importantly this is tough for me. Okay, but seriously, the worst part about this is that it deprives me and every other Mets fan of seeing Harvey take the mound for over a year if he ends up having Tommy John surgery. Harvey is an incredible pitcher and I consider myself lucky to be able to experience him in a Mets uniform. This season is almost over, and the team obviously is not going anywhere. WARNING: UNPOPULAR OPINION ALERT! PLEASE DO NOT CONTINUE IF YOU CANNOT HANDLE HEALTHY DISCUSSION AND ARGUMENTS. On Wednesday, my friend Spencer and I decided to buy tickets to Friday night's Mets/Tigers game. Thursday afternoon, the Mets announced that they have signed Daisuke Matsuzaka to major league contract and that he will join the rotation on...Friday. I already knew that Matsuzaka wasn't very good, but I decided to check out his baseball-reference page. Let's just say, some things are best left unknown. I get it, the Mets are very thin on starting pitching unless they stupidly rush someone like Rafael Montero or even Cory Mazzoni up to the major league roster before they're ready. I just really hope that the Mets don't think that he is going to be a long term solution. Or even a short term solution. I'm pretty sure it's just a publicity stunt, and I'm completely fine with that, the season is almost over and they are going absolutely nowhere (except hopefully second place!). We knew that Friday night's game would be interesting, which is why Spencer hatched this gem of an idea. The sad part was that looking at a lot of the reaction, I felt like one of the few who understood just how bad Matsuzaka is at his job. Well he started the game off striking out Austin Jackson looking, leading to us immediately placing a backwards "K" on our sign. Then in probably the most hilariously accurate microcosm of his career, he followed up that great start by giving up a bomb to Torii Hunter. Things got worse in the second inning when Hunter hit a ground rule double to drive in a run, Miguel Cabrera happened, increasing the lead to 5-1. After that, Dice-K seemed to settle in a bit, throwing Cholula Hot Sauce level heat with his blazing fastball that topped out at 91. Look, as long as he's not meant to be a part of the long term future, I really don't care either way because this is a dead season. That is, as long as when the September callups happen, he isn't stealing any time from a more important, younger pitcher who actually has a future with this team. This upcoming football season, I'm excited for many things. The Super Bowl is coming to MetLife Stadium. There are so many young, exciting players ready to take the league by storm. Mobile quarterbacks are all the rage these days. That’s all well and good, but unfortunately for me and every other person in my situation, none of that excitement involves the New York Jets. In fact, Jets fans feel the polar opposite of excitement this summer. 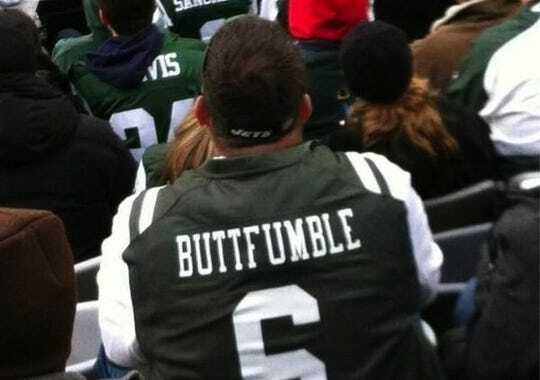 Disgust, dread, embarrassment, anger, and in some cases, complete apathy are the feelings that the Jets have and will conjure up in the hearts of their many “fans” this year. My Jets aren’t just bad, they will be downright disgraceful. The worst part is, it didn’t have to be this way. The Jets roster is a result of extremely poor management by Mike Tannenbaum allowing the roster to deteriorate year after year without seeming to care. Despite getting to the AFC Championship Game in 2009, the 2010 season was the only real chance the Jets had of getting to the Super Bowl, which they nearly did. Since then, management has done an awful job at keeping some semblance of talent on the team. And now Tannenbaum is gone, but his stench still remains surrounding the team like child support surrounds Antonio Cromartie. While I think that John Idzik and Rex Ryan have the right idea, it’s going to be a few horrible years before the Jets can even think about an 8-8 record. But for now, enjoy the Mark Sanchez to Braylon Edwards connection that got old three years ago!!! *NOTE* Thanks to horrible internet, it's been 41 days since I wrote this, and I can only post it now that I'm at the airport. As you may already know from my last post, I have been in Ghana for the past week and a half. While my family is originally from here, and it’s been a relaxing time here, I have one major issue with this country. Internet is not as widely accessible as it is to me back in New York. I have a wireless modem here that gives me reasonably slow internet at home. Then there are the internet cafés, which are usually reliable, until I went to one on Monday which for some reason had newyorksportsplus.com blocked. So now I’m typing this on Word, to then upload using my modem.